University tuition fees in England will rise to £9,250 per year from 2017 and the increase could apply to students who have already started courses. Universities minister Jo Johnson has published a statement setting out plans to link higher fees to better teaching. The fees will increase by inflation in subsequent years. The Liberal Democrats say they will force a vote by MPs in the autumn in a bid to stop raising the current £9,000 limit. Labour's education spokesman Gordon Marsden said that "nothing less than a full debate" on raising fees would be acceptable and that ministers had so far "neither the guts nor the courtesy" to have an open debate on their intentions to raise fees. Mr Marsden accused ministers of a "disgraceful" attempt to "sneak out" the increase on the last day before Parliament's summer break. The National Union of Students and the UCU lecturers' union have announced a protest demonstration in November. The inflation-linked rise represents a 2.8% increase and if that continued would mean fees rising above £10,000 in the next few years. The government says the increase can apply to students who have already begun courses - but this will depend on the terms of student contracts in individual universities. Royal Holloway and the University of Kent have to still to decide on whether to charge higher fees for current students, but expect to apply them to new students starting in 2017, if the fee limit increase goes ahead. The University of Surrey will not increase fees for its current undergraduates, but fees will increase each year for students starting in 2017. The government says if the fee rise is challenged in the House of Commons, there is likely to be a vote by MPs in the autumn. The Liberal Democrats have said they will fight the plans "every step of the way". Angela Rayner, Labour's shadow education secretary, said "these further increases in fees will be a barrier to aspiration, making it even more difficult for those from low and middle-income families to get the best education they deserve". On Wednesday some MPs criticised universities that have already announced higher fees, before the current £9,000 limit has been removed. Liberal Democrat education spokesman John Pugh accused them of "disgraceful arrogance". But on Thursday the government issued a statement formally setting out the process which will see fees rise above the £9,000 upper limit. Increases will be linked to evidence of high quality teaching, which will be decided by a new mechanism called the "teaching excellence framework". For the first year, it is not believed that any university or college has failed to reach the necessary quality threshold, so all universities will be able to charge a new upper limit of £9,250 per year. 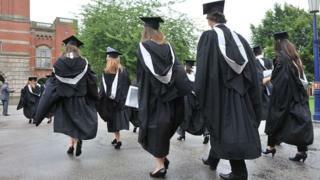 The government says it wants to protect the value of tuition fees from erosion by inflation. Universities face the dilemma that under consumer protection requirements they will need to announce the £9,250 fee before the beginning of the next application cycle in early September. But until formally changed by Parliament, universities are not allowed to charge a fee higher than £9,000. Liberal Democrat university spokeswoman Baroness Lorely Burt said: "Linking fees to teaching quality in this way is unacceptable. Enabling any university that scrapes a 'meet expectations' rating to increase fees by 2.8% shows that this isn't about teaching quality at all. "If universities need further support then let's have a proper discussion about where that money comes from, rather than pretending that this is somehow a quid pro quo for providing the quality of teaching students should already be able to expect." Sir Peter Lampl, chairman of the Sutton Trust education charity, said the fee increase "will add to student debts that we have shown to be by far the highest in the English-speaking world". "A real concern is that the removal of maintenance grants will almost certainly deter poorer students, who now face debts of over £50,000 on graduation." Nicola Dandridge, chief executive of Universities UK, said: that the value of fees had been lowered by inflation - so that it was only worth £8,200 in real terms since it was introduced in 2012-13. "This inflation catch-up is essential to allow universities to continue to deliver a high-quality learning experience for students," she said. A government spokeswoman said: "The ability to maintain fees in line with inflation has been in place since 2004, and is subject to regulations. "This is not part of the Higher Education and Research Bill. The teaching excellence framework will allow universities to maintain fees in line with inflation only if they meet a quality bar, as set out in the recent Higher Education White Paper."